First thing is first, a big thank you to my first 2 sponsors (aside from the parentals), Kevin Sullivan and Rory LaGrotta! Thanks for the support! Uhh…. on Tuesday it was -12F when we finished sliding and I thought my hands were going to fall off. I mean, people think skeleton is crazy… but why the hell would you wanna hang out outside for 9-15 days in -100F weather? That is legitimately terrible. I see no positives. Here is the view from my current seat. 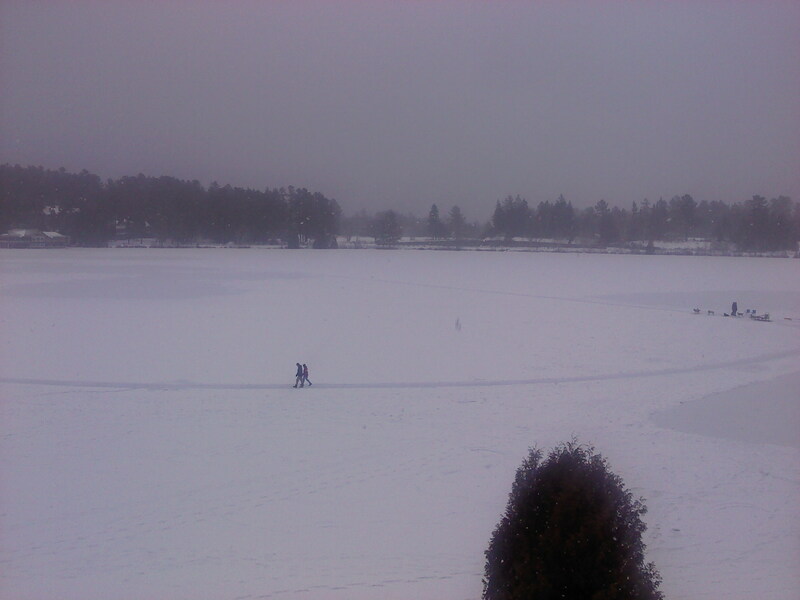 Grey skies, snow, a frozen lake, and dog sleds! 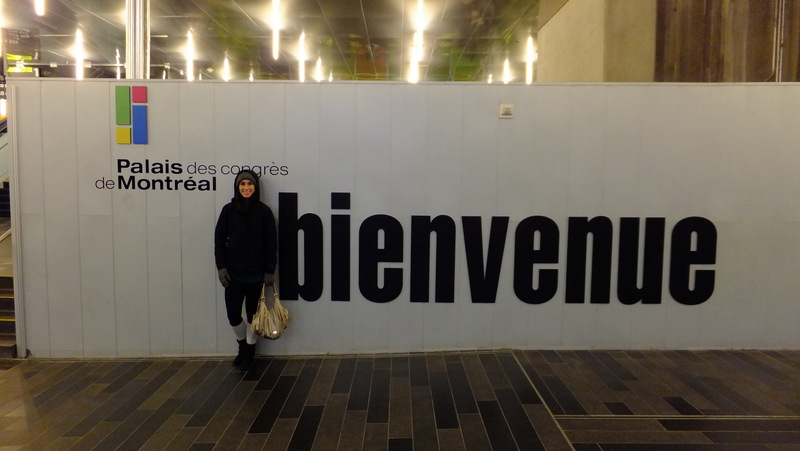 To backtrack a little, before the holidays I went to Montreal for the weekend with Adrienne, Nick and Jeremy. After some of the hostels I stayed in while traveling Europe (ie- Amsterdam, Prague… the airport) this hostel was super nice. If anyone is planning a trip up there, I recommend Montreal Central. At the time, I thought it was cold but this past Tuesday’s -12F made me realize that +10F is warm. My definition of what “cold” is redefined every week. Montreal was really cute. It’s only 2 hours away which made for a good weekend getaway. There are parts of it that remind me a lot of a picturesque European town. But I also managed to go to a casino for the first time. Adrienne and Jeremy played some poker and came out on top. I mostly people watched. I don’t know if all casinos are like the one we went to, but it was nothing like that TV show “Las Vegas.” Pretty sure Adrienne was 1 of 3 women playing poker. The first day we walked around the town and I ate the best sandwich I’ve ever had in my life. I do not kid. THE BEST. It was a smoked meat sandwich and would certainly make any vegetarian a bit queasy. I didn’t take any pictures of my sandwich but here’s one I found online. Ok, enough about sandwiches and the Iditerod… back to skeleton. Upon returning to Lake Placid, I got my new sled. The ice all week has been pretty fast, which made for an interesting first few days of sliding on a new sled. I padded it on Tuesday which took 4 hours. Yeah, 4 hours. What is worse, is that I will certainly be doing that more than once. You have to cut out a dense foam to fill in the sled. It is a very tedious process. I will take pictures of my sled this week and add them into my next post! 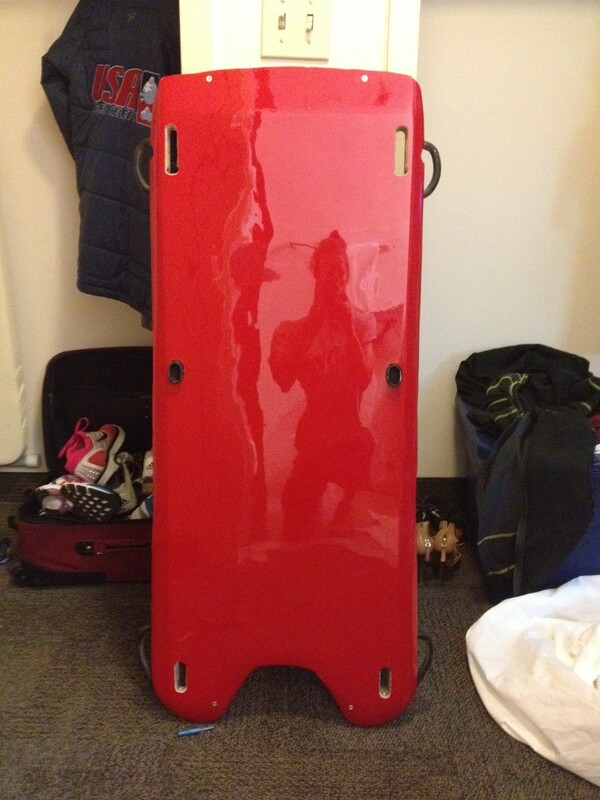 The pod (this is the plastic cover on the bottom of the sled) is a plain black right now. I will be getting a new one in the summer and plan on painting it. In the mean time I need to come up with an appropriate name for her. Yes, I decided my sled was a “her.” I’m open to suggestions! We are going cross country skiing this week as a team. Wish me luck. Anyone who knows me, knows that this whole long distance/cardio thing is not really up my alley. I think the longest I have run in the past 6 months has been 21 minutes. And it was not fast. Ok, I’m making myself sound really un-athletic. So let me remind you guys, I love sprinting. I have never been skiing before in my life and the thought of doing all the work to move from point A to point B seems like… well… a lot of work. I like it when gravity moves things for me. But I want to learn how to ski and I’m sure it will be fun. Workouts this week have gone pretty well. I have started to incorperate triple jump drills into my workouts. Why you ask? Well the push start is very dependent on hip flexor strength and flexibilty. The drills are an excellent way to work on that. It makes me kind of miss triple jumping. Then I remember the perpetual sandy pants and I am brought back to reality. Also, because it is too cold to sprint outside, the longest I can sprint for in our gym is about 35 meters. It is a nice change of pace. I am off to see Sherlock Holmes at the movie theater that costs $7. NO MORE TYSONS CORNER AND $16 MOVIE TICKETS. Win! I will have those pictures of my new sled for you guys next time!